Hundreds of professors at UBC are struggling simply to pay their bills. Professor Colin Green has been teaching in UBC’s history department for 15 years — but at least once a year, he has to re-apply for his job. Green is a sessional lecturer, one of 437 at UBC who are hired on short-term contracts. While sessionals often teach the same number of courses as permanent faculty, their pay and treatment are far from equal. 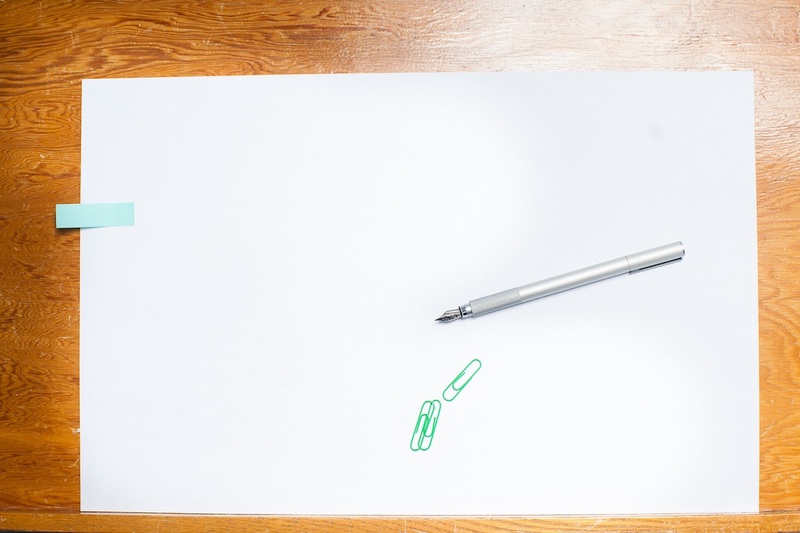 Sessionals like Green often report feeling stuck — unable to progress in a competitive academic environment they believe places little value on employees who are, at the end of the day, expendable. With no job security and low pay in one of the most expensive cities in North America, hundreds of employees at a world-class university are struggling to simply pay their bills. Facing tighter and tighter budgets, the appeal of replacing retiring faculty with flexible, inexpensive contract workers is too much to resist for Canadian universities. The Canadian Association of University Teachers estimates that contract faculty numbers have tripled since 1999, while regular faculty have only seen a 14 per cent increase. According to CBC, more than half of Canadian undergraduates are now taught by professors on short-term contracts. While permanent professors have fixed salaries, sessionals are paid by the course and at UBC, pay for sessional lecturers is based on subject and seniority. A senior law professor can be paid $11,000 or more per course, while a less established engineering professor could get as little as $4,000 for the same number of credits. UBC Faculty Association Contract Faculty Committee Chair Sarika Bose said the nature of this pay scale means many of her peers aren’t financially secure. “Some sessional faculty are in a position where they have to choose between heat and rent, or groceries and rent,” said Bose, who is herself a sessional lecturer in the English department. A senior sessional professor in the faculty of arts can make as much as $55,000 a year, but the number of courses they teach is decided by the department, so there’s no guarantee of work. UBC Vice Provost and Associate Vice President Academic Affairs Eric Eich — who has been a sessional lecturer in the past — said some enjoy the position because they’re able to focus solely on teaching, as opposed to the research and administrative responsibilities that come with a permanent position. “Sometimes if you have a person and they’re teaching in a very specialized area, then they just maybe want to teach that one course,” he said, though he recognized that those are the minority. Many sessional faculty take on multiple jobs just to make ends meet. Green, for example, is also a full-time instructor at another university, a position he balances with a full-time course load at UBC. “I have to teach [extra] courses [there] just to get within spitting distance of UBC salaries,” he said. As Bose explained, this solution comes with its own drawbacks. Eich said the university is working to replace sessionals with 12-month “lecturer” contracts that will run for up to three years at a time. Those contracts will be renewable indefinitely “upon evidence that they’re doing a really good job, really excellent teaching,” he said. Eich expects the number of sessionals to “drop dramatically” in the coming years. Compared to most sessional salaries, lecturer positions are well paid. A lecturer in the arts department makes around $62,000 a year, compared to $55,000 for someone at the top of the sessional pay scale. But while sessionally contracted faculty aren’t generally expected to do work beyond teaching, faculty in lecturer positions can be tasked with course preparation and service requirements that aren’t explicitly outlined in their contracts. That means that a teacher on a 12-month lectureship could potentially do more work relative to their salary than a sessional teacher. Often forced to work extended hours and multiple jobs to make ends meet, many sessionals find it difficult to fulfill their responsibilities with the limited support they’re given. Sometimes, it’s as simple as trying to get a loan. Because contracts are typically no longer than two school terms, sessional lecturers don’t have guaranteed long-term employment. In one of Canada’s most expensive real estate markets, that makes getting a mortgage difficult. The solution for many sessionals is to take on a full-time job at other colleges around Vancouver in addition to their work at UBC — but that carries its own hardships. According to the university’s 2009 Workplace Experience Survey, obtained by The Ubyssey through a freedom of information request, almost two-thirds of contract lecturers said they struggled to find a balance between work and life. (In the 2011 and 2014 surveys, sessionals’ answers were no longer grouped together). While sessionals are paid on contract, Bose noted that many of them work beyond in-class hours to prepare for courses, meet with students and keep up with research. Eich said he could empathize. While sessional lecturers often have the same credentials as full-time faculty, their temporary nature — and lack of contractual protection — means that they can feel underrepresented and unheard within the university. 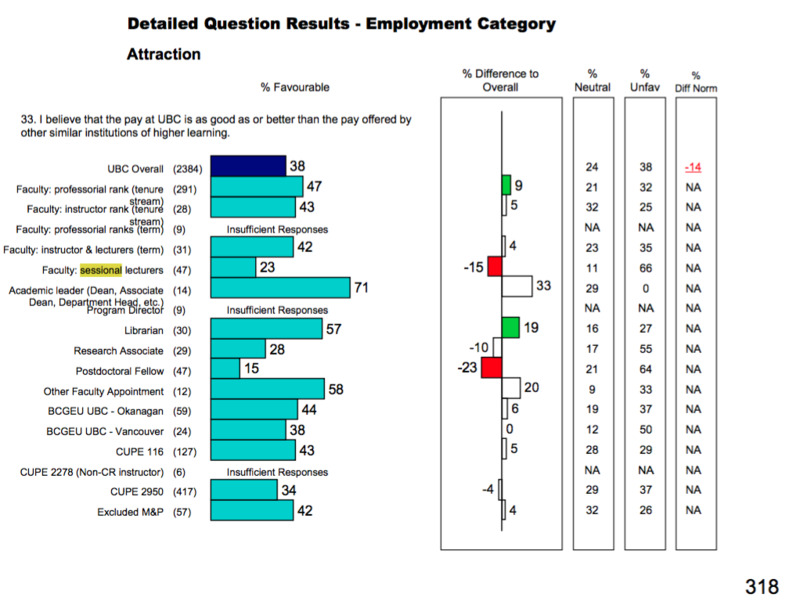 According to the 2009 survey, sessional faculty are consistently the least content employment group at UBC. 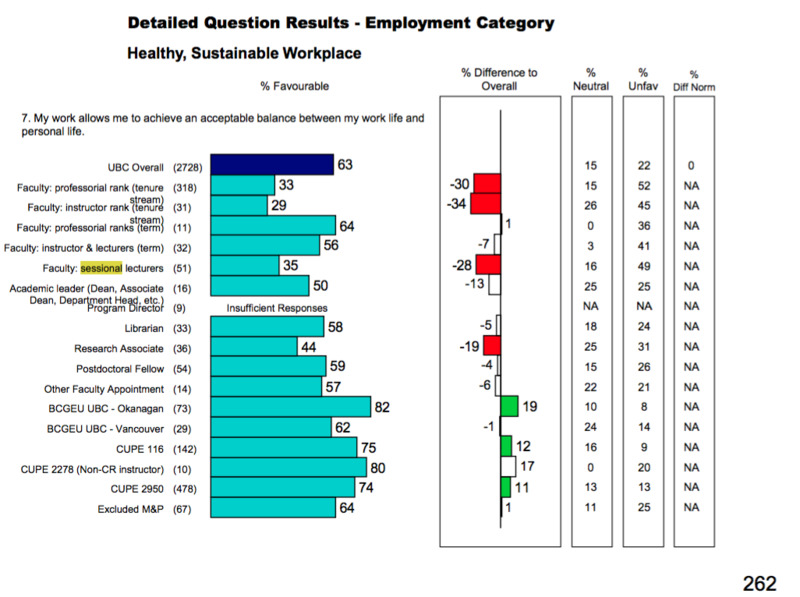 When asked if their workplace was healthy and sustainable, only 44 per cent of sessional faculty agreed, compared to an overall average of 70 per cent — lower than any other measured group. Bose emphasized that this phenomenon isn’t specific to UBC. Across schools, sessional teachers often feel the nature of their contract affects how they’re treated by peers and evaluators. “They feel what is recognized is what they’ve done wrong rather than what they’ve done right,” she said. The 2009 survey noted that only 22 per cent of sessional faculty felt they were recognized for accomplishments at work, while a dismal 5 per cent believed promotions, transfers and appointments are made fairly at UBC. Bose said the stigma around contract faculty can even impact their credibility with university officials, even with something as simple as a letter of recommendation for a student. Eich reiterated that while permanent faculty have more research and administrative duties, he understands the appeal of advancing one’s career and finding a “home” within a department. Sessionals seem to agree — just 10 per cent surveyed in 2009 felt they had sufficient opportunity for advancement in their careers at UBC. And UBC is far from alone. Frustration over precarious working conditions boiled over last year in Ontario when faculty at dozens of colleges and universities went on strike, citing job security as a main concern. Sessional faculty complained that despite contributing as much as 70 per cent of certain departments, they were underpaid, overworked and faced constant insecurity about whether they’d be guaranteed work. Some sessional lecturers at UBC would like to follow suit — but since the collective agreement dictates resolutions be solved by binding arbitration, they aren’t allowed to strike. Even if they were, the university could easily terminate them at the end of their contracts without legal consequence. 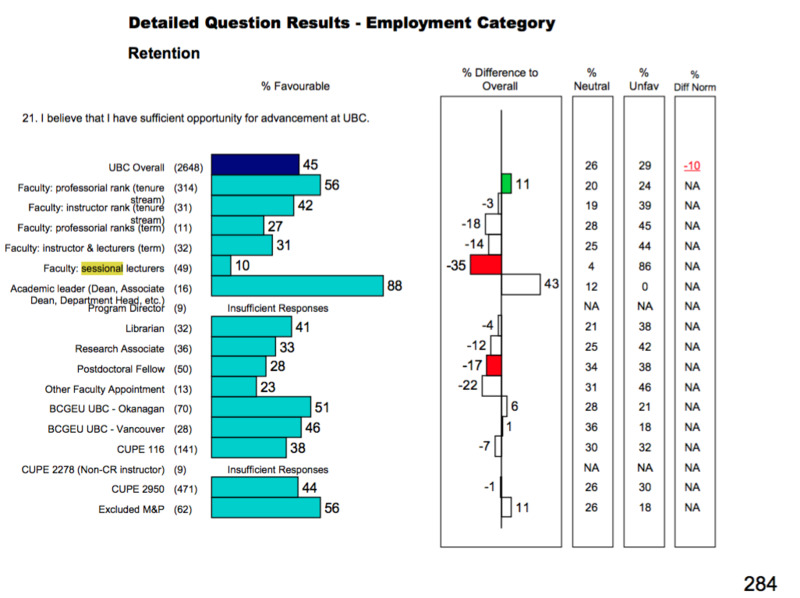 Similar frustrations are apparent at UBC — only 13 per cent believed they could achieve their long-term career objectives at UBC; less than a third would recommend UBC as a place to work and the same number believed their performance was assessed fairly. Most tellingly, only 28 per cent believed the administration would respond to the issues posed in the survey, signalling a crisis of confidence in the institution itself. Under the collective bargaining agreement between UBC Faculty Association and the university, sessional lecturers have to be notified of full-time faculty appointments, but they don’t necessarily get preference over outside candidates. In addition to precarious pay, sessional lecturers are often cut out of benefits guaranteed to other staff. According to the collective agreement, staff are guaranteed pension benefits if they work for UBC for four consecutive months. This means sessionals working on a term-by-term basis don’t get benefits during the summer — even though they’re teaching the same amount of credits. Green said that after he raised a complaint, a mediator found that two back-to-back sessional contracts should be read as one continuous pay period, making summertime sessionals eligible for full benefits. Afterwards, he said, UBC began to issue contracts that purposely put a few days of leave between the end of a sessional lecturer’s spring contract and the beginning of their summer one. Instead of viewing it as one continuous employment period from January to August, he said, it was broken in two — meaning sessionals don’t collect benefits in the summer term. “If I teach exactly the same six courses in the summer, I get nothing — or I only get half of what I would normally get for pension contributions,” said Green. Bose noted that sessional lecturers can still collect some pension benefits while working in the summer, but to do so, they have to write post-dated cheques back to UBC, taking the needed amount out of their paycheques manually. The survey data indicates that many sessionals might not even know that was an option: only 34 per cent reported being aware of UBC’s provisions and benefits to support their personal needs. For many sessionals, the inconsistent benefits are just another example of how they feel marginalized within the faculty association. 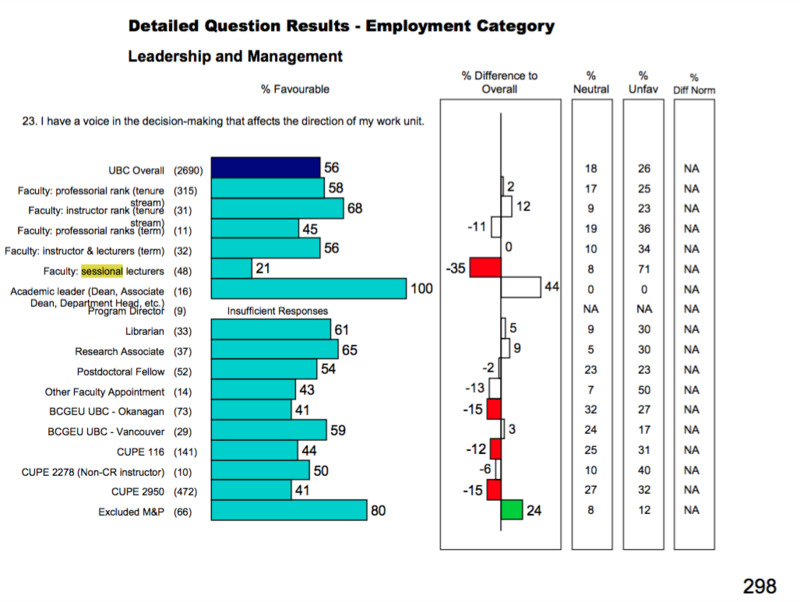 According to the 2009 survey, nearly four-fifths of sessional staff felt uninvolved in decisions that affected them. So why do sessionals continue to teach at UBC? Many have family in the region, some are drawn to UBC’s marginally-better pay for contract faculty compared to other institutions and many are ultimately proud to be a part of the school. Eich emphasized that sessionals hadn’t fallen off UBC’s radar, mentioning the lectureship model again as a path forward. At the end of the day, Bose maintained her goal is to help her students — even when that’s easier said than done.